Seven days reclaiming a refund and still no response. This is not serious. If no solution, in two weeks I will be in another store. First of all, I bought an annual PC membership subscription but am still charged for monthly membership subscription every month! Actually, after you launched the new website, I checked my subscription record and did not find anything. 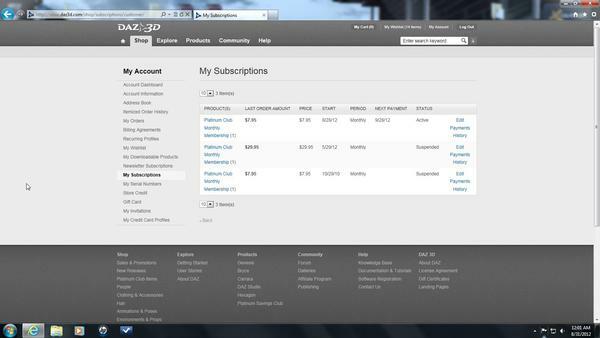 That is to say, my annual subscription is not used at all, although it was paid in full 15 months ago!! And, even so, I did not get my June monthly rewards of US$ 6.00!!!!!!!! What happened? I think I seriously need your help (or any support staffs) to solve this issue ASAP! You need to submit a support ticket, using the Zendesk system and "Sales"
It looks to us as though you bought a new subscription, instead of a renewal. Give Sales dept as muchinformation as you can, and payment method used.. Thanks, could you please give me a link for the Zendesk? while I geting the PC newletters I cannot go to the Member Only forum too. For anyone that needs to use Carrara 8.5 beta, but can't, because of the serial number issue, here is is a kick fix until they post the new serial number. For XP only - close Carrara then change your date to anytime last week (e.g. Monday 9th July 2012) then open Carrara again. In answer already submitted a support ticket - snort- will stay polite about that one . I'm about to lose my patience, AGAIN! AGAIN! AGAIN! What is it you people aren't getting here? 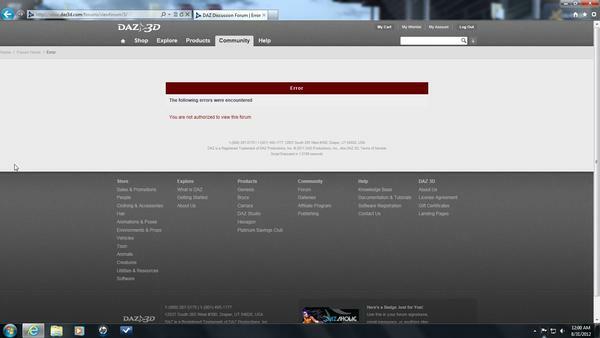 Again, I can't get into the PC forum! Yet my account shows its still active! I'm tired of submitting support tickets! Now I'm "NOT AUTHORIZED TO VIEW THIS FORUM!" Yet AGAIN! I do apologise, but at the moment the only solution is to send a support ticket. DAZ 3D is currently working like crazy to get the PC sorted out. It has been posted in another thread about this problem that a new system is being tested as we speak, will be rigourously tested before it is set live. I find that sometimes when i click on a forum post link from an email that has been deleted. That is true Ian, but unfortunately not in Betsy's case. PC memberships have been dropping put with regularity for some people, which is why DAZ 3D are working so hard on sorting out and stabilising the PC system. I went to the Edit button in My Account and it only had Cancel or Suspend Subscription....so added it to my cart from the store page and it wanted to charge me $29.95 when I went to checkout :-(. Guess I will call when they open....sigh. I am in the same boat as you and I did not even get the email. Only way I noticed I did not have PC anymore was when I went to check on the $1.99 stuff and it was all Full Price :-(. Well, I just had to manually renew my membership, because the CC info they had had been corrupted in the 'upgrade'. I think I have it corrected and paid for, although it's saying delivery as '6/30/12' and renewal as 7/30/12. So either I'm getting an extra month ('cause I can access the PC forum now) or thre is another hiccup in the system. Once again, I'm wondering who the hell decided to push the upgrade live without fully testing it? How many months has it been since this problem started? Its absolutley amazing to me that DAZ is still in business, with customer service like that Wal-Mart would have been out of business by now! In defence of Daz I have to say that anytime I've ever had a problem they have been more than polite and helpful and usually the problem is fixed right away. One thing I don't have any complaints about is their cooperation and the effort they put into making things right! How about the defense of the customers? We have put up with this crap since April, no excuse for that, when I went to submit a support ticket just awhile ago, for some reason the page froze up, and it wouldn't submit, makes one wonder! Okay! I've tried to submit a support ticket, three times today I've tried, get everything filled out, and then click submit, nothing happens, no tickets are generated, did they turn that off too? Okay, so I tried one more time to get into the members only forum, and went right in, so it looks like things are working again, this time! Wonder how long that will last? I've got a problem with not being able to get into the Members area of PC as well. I've sent a form into Tech Support though as it's the weekend I'm guessing I won't hear anything for a while. This is happening to people all over the place many are losing there PC membership stauus while still paying while on the other hand others are being given months free and vouchers. According to one mod the fix is easy, which makes you wonder why it takes so long to do unless you have the advantage of being able to phone. My PC subscription is due to end later this month [if memory serves] but I have nothing listed under "My Subscriptions" so I do not know the date of its expiry. Still active member as I am on this forum and getting PC prices. Is anyone else having this problem? Look at your account, itemized order history for Platinum Club Annual Membership - the date of the order is the date my membership will run out. There is a Platinum Club Membership Annual Renewal too, that one tells me when I last paid. Thanks! The renewal was made Sept 20th but the original membership was Sept. 25, so I will assume I expire on the 25th. Hopefully they will announce the details of the PC sale by then as this year a lot is hinging on whether they can make it a "no brainer" again. My annual didn't renew and It closed me out early from PC. I'm already out and can't get the renew price, all I see is the full $99.00 priced. Already did .. sort of a lost cause on a weekend if they end it early on you.